Green Communications’ software (GreenSoft) is the key enabler of Participatory Internet (Green PI). GreenSoft allows hardware to connect automatically with other Green PI devices to create a self-configuring Wi-Fi network including quality of service, local content, apps and services. 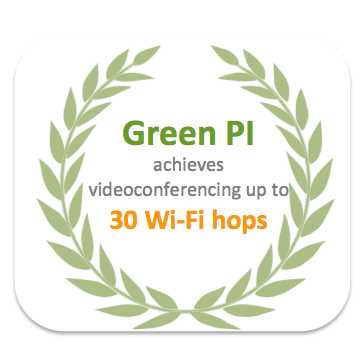 Green PI’s robust routing protocol achieves videoconferencing up to 30 Wi-Fi hops. Green PI self-organized network also connects squads of flying drones and groups of connected agents. For clients references, please contact us. It detects the other devices that are part of the network. It estimates QoS properties for each link. It computes (possibly indirect) routes to other devices and sets the system’s routing table up accordingly (thus ensuring that every device forwards data properly and that any network host can reach any other host). When some devices forward data from the mesh network to other networks (e.g., the Internet), it ensures that all network hosts may reach these other networks. GreenSoft features a handoff manager program. This is a userspace daemon that helps routers provide access points to regular Wi-Fi users. These users, though outside the core network, may associate to the access points and get regular network connectivity through the mesh network. The handoff manager ensures users can move from an access point to another without disrupting their connections. GreenSoft may advertise Zeroconf services to other devices and users; and that users may also advertise their own Zeroconf services to the network (including other users). Green PI’s routing protocol is the result of 10 years of research and development and a technology transfer from best French universities. Participatory Internet achieves unique performances in terms of network robustness and mobility relaying real time video up to 30 Wi-Fi hops.